Here is a selection of concert reviews. Record reviews will be found in the discography. “Guided by their founder Graham O’Reilly, the Ensemble William Byrd recently tackled the fascinating repertoire of 16th and 17th century contrafacta. In so doing they showed how Monteverdi was able to transpose his humanism into an equally stimulating sacred context, with a real exposition of the power of both texts – secular and sacred – set to music first published in the 4th and 5th madrigal books (1603 and 1605). To be precise, the contrast between the secular originals and the sacred versions made by Canon Coppini – an ardent supporter of the man from Cremona – was fully visible in the sensitive approach of “the Byrds”, which went well beyond simple word-painting: a real adaptation from amorous description to religious feeling, both by style and by sound. A few examples of their expertise: the metamorphosis of the voluptuous Si ch’io vorrei morire, transformed by Coppini into the fervent O Jesu mea vita; the transformation of the spiralling chromaticism of Piagne e sospira into the almost liturgical lamentation in Plorat amare. 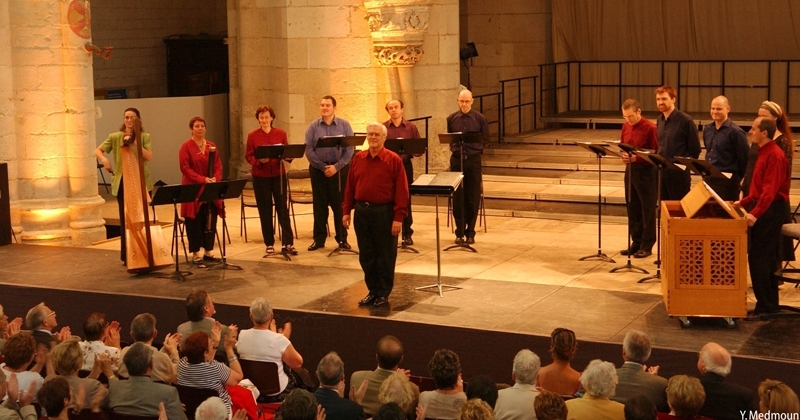 These brought us to the highlight of the evening: the confrontation of the Lamento d’Arianna – here given with a mix of Monteverdi’s own version for 5 voices (from the 6th book of madrigals of 1614) and the original solo – and the Pianto della Madonna for solo and continuo: without a doubt the most symbolic of the contrafacta published by the composer in his Selva Morale e Spirituale. “The German church was filled with a beautiful choral colour, at once homogenous and indivualised, with a steel edged precision of the kind one thought was unique to our Swedish Radio choir”. “Three decades before, contemporary with the birth of Bach, Henry Purcell’s music — its passions much colored by his studies of Italian music — also acquired much of the power to disturb and to amaze that would later come to Bach in a different world. At the First Congregation al Church in, as you might guess, one of the “Historic Sites” series, which remains unrivaled anywhere else, the small group (five voices plus organ), Paris – based, that calls itself Ensemble William Byrd turned Purcell and his French contemporary Marc-Antoine Charpentier into magic on a recent Sunday. If the Ensemble William Byrd has distinguished itself so far in the repertoire of the pioneers from across the alps (Monteverdi, Gabrieli, Cavalli) and of the masters of the English Golden Age (Byrd, Gibbons, Purcell, Handel), their most recent concert in the church of Saint-Sévérin was a very pleasant surprise for lovers of Charpentier. It was a voyage of reflection and emotion which revisited with the necessary understanding certain gems of his religious output, such as the Trois Méditations pour le Temps de Carême and that other masterpiece of suffering, Le Reniement de St Pierre, both of which are classified as Histoires sacrées. Throughout, the pupil Charpentier shows himself the equal of his teacher Carissimi in his visualization of the different episodes of the story, to the point that one may classify his work as true liturgical theatre. To be more exact, the dialogue with the self becomes influenced by the striking images of the story, the fruit of a profoundly baroque imagination. In this way, the composer reproduces the human aspect emphasized by the founders of oratorio, an aspect totally understood by Graham O’Reilly and his small team. As much at ease among the outpourings of the soul as when expressing the emotional force of words, the six singers (both men and women), accompanied by a continuo of chamber organ, theorbo and bass viol, were engaged in a real exercise of rhetoric, which was also evident in the touching Nativitatem Domini Nostri Jesu Christi and in the Salve Regina for three dessus; showing Charpentier as the master of musical preaching, where the perceptibly sensitive gesture is associated with the uplifting act of prayer. Last night there was a wonderful opening concert with the Ensemble William Byrd. Last Thursday evening, in the Petrarch theatre, the Ensemble William Byrd not only recreated beautiful and rarely-heard music by Monteverdi, Charpentier and Rigatti, but also gave us the real taste and spirit of the period, with their careful mixing of timbres, rhythmic mastery, and fine balance between voices and instruments.